Many UU congregations have asked about their members, "Why do they leave?" Kate Erslev asks, "Why do they stay?" 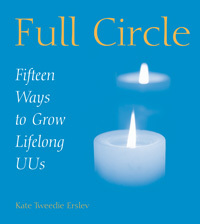 Here she explores the 15 common threads that lifelong UUs identified as critical in their commitment to their faith. Erslev surveyed and interviewed 82 men and women from ages 25 to 87 who were raised as UUs. A lifelong UU herself, Erslev has been a DRE for over 20 years.